SKGaur's Blog | Lets go exploring ………………….. Most of the devops engineer face the problem of disk full, no matter how much they have thought about projected data space required at the project planning stage, sooner or later data migration is the reality. Today will be talk about the steps involved in the migrating the Bamboo artifacts and nexus data repo migration to a bigger disk attached to ec2 instance. Step 2: Select the created volume, right click and select the “attach volume” option. Step 3: Select the instance from the instance text box as shown below. Step 4: Now, login to your ec2 instance and list the available disks using the following command. Step 5: Format the volume to ext4 filesystem using the following command. Step 8: Mount the volume to “bamboo-data” directory using the following command. Step 9: cd into bamboo-data directory and check the disk space for confirming the volume mount. Make an entry in the /etc/fstab file. Back up the /etc/fstab file. Open /etc/fstab file and make an entry in the following format. Shut down your repository manager from the terminal. create a symbolic link on the filesystem linking it back to the original location. Containers-as-a-Service is a model where IT organizations and developers can work together to build, ship and run their applications anywhere. There were traditional methods to build, test, package and run applications : Baremetal Deployment or Virtual deployment. Although these deployments, use and sell were simplified by ready-to-use cloud services from various vendors in the form of IaaS, PaaS and SaaS, but still there were gaps. 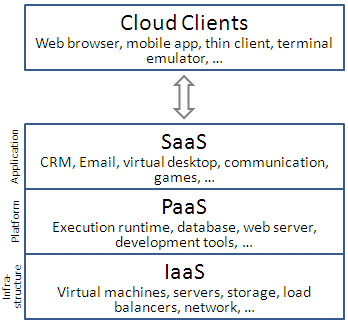 PaaS providers uses IaaS. A PaaS provides a self-service portal for managing computing infrastructure. PaaS allowing developers to develop, deploy and test applications. PaaS increases developer productivity.e.g. Google App Engine, Heroku, openshift, salesforce. Makes development possible for ‘non-experts’; with some PaaS offerings anyone can develop an application. PaaS provide OS, server software, DB, storage, network tools for design and develop and hosting. Flexibility; customers can have control over the tools that are installed within their platforms and can create a platform that suits their specific requirements. Adaptability; Features can be changed if circumstances dictate that they should. Teams in various locations can work together; as an internet connection and web browser are all that is required, developers spread across several locations can work together on the same application. SaaS uses the web to deliver applications that are managed by a third-party vendor and whose interface is accessed on the clients’ side. e.g. Google Apps, Cisco WebEx etc. SaaS replaces traditional on-device softwares. Docker CaaS (Containers-as-a-Service), allowing any Docker container to run on their platform, filling a void between IaaS (Infrastructure-as-a-Service) that requires a lot more system administration and configuration, and PaaS (Platform-as-a-Service) that is typically very limiting in terms of language support and libraries. Containers are here to transform how build, test, ship and run applications securely on any infrastructure. Containers as a service (CaaS) is a paid offering from cloud providers that includes compute resources, a container engine, and container orchestration tools. Developers can use the framework, via API or a web interface, to facilitate and manage containers and application deployment. Enterprise-grade on-premises service for managing and deploying dockerized distributed application in any on-premises or virtual cloud environments. It’s built-in security features like LDAP/AD integration and rolebased access control (RBAC) allow IT teams to be in compliance with industry security regulations. • Google Container Engine users organize one or more containers into pods that represent logical groups of related containers. Similarly, network proxies, bridges and adapters might be organized into the same pod. • Google Container Engine includes a replication controller that allows users to run their desired number of pod duplicates at any given time. 1) RAID-Z1 is similar to RAID 5 (allows one disk to fail), RAID-Z2 is similar to RAID 6 (allows two disks to fail) and RAID-Z3 (allows three disks to fail). The need for RAID-Z3 arose recently because RAID configurations with future disks (say 6–10 TB) may take a long time to repair, the worst case being weeks. 2) ZFS has no fsck repair tool equivalent, common on Unix filesystems, Instead, ZFS has a repair tool called “scrub” . The amount of space logically consumed by a filesystem. This does not factor into compression, and can be viewed as the theoretical upper bound on the amount of space consumed by the filesystem. Copying the filesystem to another appliance using a different compression algorithm will not consume more than this amount. This statistic is not explicitly exported and can generally only be computed by taking the amount of physical space consumed and multiplying by the current compression ratio. 4) RAID-Z configurations with single-digit groupings of disks should perform better. 5) zpool replace will copy all of the data from the old disk to the new one. After this operation completes, the old disk is disconnected from the vdev. 7) ZFS deduplication is in-band, which means deduplication occurs when you write data to disk and impacts both CPU and memory resources. Deduplication tables (DDTs) consume memory and eventually spill over and consume disk space. At that point, ZFS has to perform extra read and write operations for every block of data on which deduplication is attempted. This causes a reduction in performance. 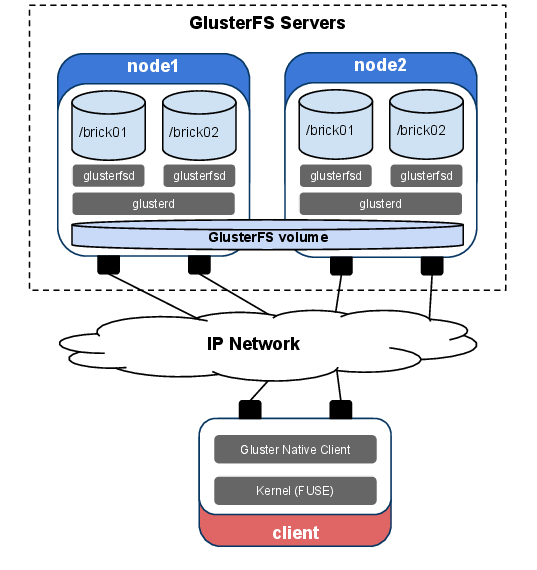 *GlusterFS is a powerful cluster filesystem written in user space which uses FUSE to hook itself with VFS layer. *Filesystem in Userspace (FUSE) lets non-privileged users create their own file systems without editing kernel code. User run file system code in user space while the FUSE module provides only a “bridge” to the actual kernel interfaces. * Though GlusterFS is a File System, it uses already tried and tested disk file systems like ext3, ext4, xfs, etc. to store the data. Distribution depends on how you are defining the create volume command, like in below example we have g1:brick1 and g2:brick1 one pair and g1:brick2 with g2:brick2 another distribution pair. which does not rely on any separate metadata server, whether centralized or distributed. * In the Gluster algorithmic approach, we take a given pathname/filename (which is unique in any directory tree) and run it through the hashing algorithm. Each pathname/filename results in a unique numerical result. * We store files in library way(alphabatic order) . * An alphabetic algorithm would never work in practice, that is why we pick hash. People familiar with hash algorithms will know that hash functions are generally chosen for properties such as determinism (the same starting string will always result in the same ending hash), and uniformity (the ending results tend to be uniformly distributed mathematically). *File system configuration changes are accepted at runtime and propagated throughout the cluster allowing changes to be made dynamically as workloads fluctuate or for performance tuning. * NFS is traditionally difficult to scale and achieve high availability. the same GlusterFS could do. * If the file is not where the hash code calculates to, an extra lookup operation must be performed, adding slightly to latency. Previously, this self healing needed to be triggered manually, however there is now a self-heal daemon which runs in the background, and automatically initiates self-healing every 10 minutes on any files which require healing. File is said to be in split-brain when the copies of the same file in different bricks that constitute the replica-pair have mismatching data and/or meta-data contents such that they are conflicting each other and automatic healing is not possible. In this scenario, you can decide which is the correct file (source) and and which is the one that needs healing (sink) by looking at the mismatching files. *When a client is witnessing brick disconnections, a file could be modified on different bricks at different times while the other brick is off-line in the replica. These situations lead to split-brain and the file becomes unusable and manual intervention is required to fix this issue. * Client-side quorum is implemented to minimize split-brains. * If you are using distributed-replicate, the max file size is the capacity available on an individual brick . *In versions before 3.6, the two bricks were treated as equal regardless of size, and would have been assigned an equal share of files. Evolving Swift where a single cluster can be distributed over multiple, geographically dispersed sites, joined via high-latency network connections. Disaster Recovery will be the mechanism for continued operations when you have multiple Swift environments in various locations. In this context DR is a continued workload operations in an alternative deployment, the recovery target clouds. OpenStack Swift in itself has architecture to deal with disasters by way of data replication to Zones that are distributed across datacenter. Swift can uniquely place replicas according to drives, nodes, racks, PDUs, network segments and datacenter rooms. A new concept of “Region” is introduced in Swift. A Region is bigger than a Zone and extends the concept of Tiered Zones. The proxy nodes will have an affinity to a Region and be able to optimistically write to storage nodes based on the storage nodes’ Region. Affinity makes the proxy server prefer local backend servers for object PUT requests over non-local ones. ** Some distinguish HA from DR by networking scope – LAN for HA and WAN for DR, in the cloud context a better distinction is probably the autonomy of management. ** To add more capacity to the cluster, Add new capacity to the ring with increased weight. ** To add more regions to the cluster, Change ring and add replica count by a fractional amount e.g. 3 -> 3.1 in ring. ** Replication traffic needs to be bandwidth-limited across WAN links, both for responsiveness and for cost. the data to nodes added/recovered as a part of disaster recovery and mitigation. Below Graph from speedometer shows that data get transfered to SWIFT from client on eth0 , once transfer completed the replication to remote site starts on eth1. Software-defined networking (SDN) is an approach to networking in which control decoupled from hardware and given to a software application called a controller. a) Separation of data and control planes and a vendor-agnostic interface (e.g. OpenFlow) between the two. b) A well-defined API for the networking (3rd parties can develop and sell network control and management apps). c) Network virtualization (Underlying network infrastructure is abstracted from the applications, no vendor lock-in). 3) The SDN Controller has complete control of the SDN Datapaths. a) At bottom, the data plane is comprised of network elements, whose SDN Datapaths expose their capabilities through the Control-Data-Plane Interface (CDPI) Agent. b) On top, SDN Applications exist in the application plane, and communicate their requirements via NorthBound Interface (NBI) Drivers. In the middle, the SDN Controller translates these requirements and exerts low-level control over the SDN Datapaths, while providing relevant information up to the SDN Applications. assigning the SDN Datapaths their SDN Controller, and configuring policies defining the scope of control given to the SDN Controller or SDN Application. 1) OpenStack Neutron is a networking-as-a-service project within the OpenStack cloud computing initiative. 2) Neutron is an application-level abstraction of networking that relies on plug-in implementations to map the abstraction(s) to reality. 3) Neutron includes a set of APIs, plug-ins and authentication/authorization control software that enable interoperability and orchestration of network devices and technologies (including routers, switches, virtual switches and SDN controllers) within infrastructure-as-a-service environments. OpenDaylight is an open source SDN project with a modular, pluggable, and flexible controller platform at its core. This controller is implemented strictly in software and is contained within its own Java Virtual Machine (JVM). As such, it can be deployed on any hardware and operating system platform that supports Java.OpenDaylight has driver for Neutron. 1) OpenFlow-based networking systems are one possible mechanism to be used by a plug-in to deliver a Neutron abstraction. SDN is focused on the separation of the network control layer from its forwarding layer, while NFV decouples the network functions, such as network address translation (NAT), firewalling, intrusion detection, domain name service (DNS), caching, etc., from proprietary hardware appliances, so they can run in software. Both concepts can be complementary, although they can exist independently.